We love tea. In every imaginable form. We never tire of exploring the endless possibilities that tea offers. Some of these ideas are implemented into elaborate craftsmanship. We take these creative excursions because we want to inspire people about what is possible with the traditional good tea. And we continue to research and, among other things, develop the ideas for the market of tomorrow from these creative projects. 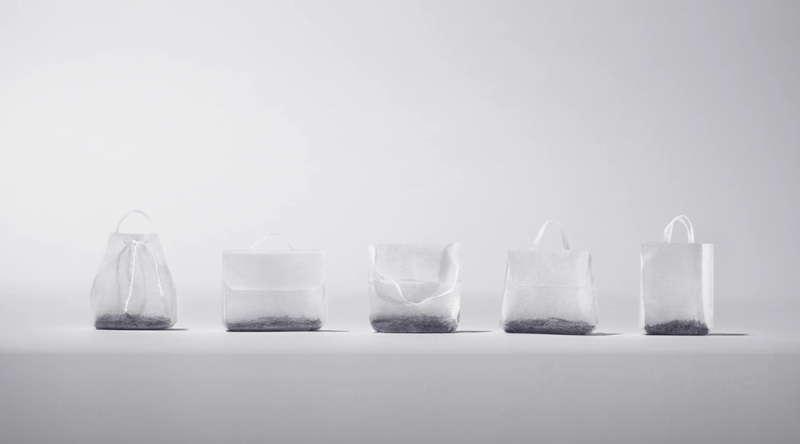 A true expert was won for the unusual project: the multi-award-winning fashion designer Ayzit Bostan, who developed five iconic micro-format bag models that perfectly underscore the character and quality of our tea. The teabag collection was designed as a handmade gift for business customers. It is not available for sale. This 2013 project was born of the idea to merge the traditional commodity of tea with one of the world’s oldest promotional gifts, the calendar. This led to the creation of a unique annual calendar – made of real tea. It consists of 365 calendar pages formed from tea, pressed very thinly and delicately flavoured. It was elaborately handcrafted as a gift for customers. We launched this new product idea together with the creative agency Kolle Rebbe, Hamburg. It won a series of international design awards, including the Cannes Golden Lion. At the New York Festival in April, the calendar won a gold award and two silvers. At the One Show Awards in New York, it also won gold and silver, as well as gold at the CLIO Awards and four bronzes at the Art Directors Club competition in Germany. It was a labouriously handcrafted limited edition as a gift for business customers and was not for sale. 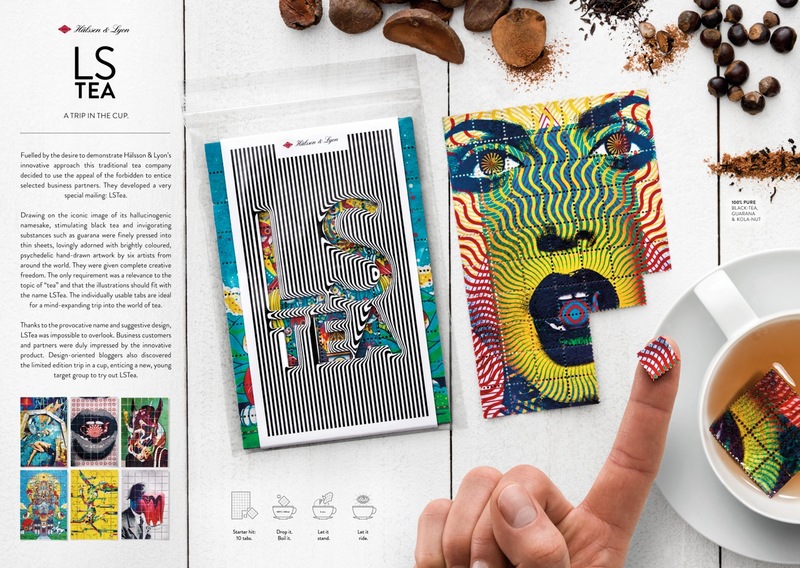 In 2015, Hälssen & Lyon submitted its LSTea creative project in the design and promotion categories of international design competitions, and won several awards including the international LIA Award. This customer promotion campaign, implemented together with the creative agency Kolle Rebbe, involved wafer thin tea leaves printed with psychedelic motifs by six international illustrators, deliberately and provocatively designed to look like LSD tabs from the 1960’s. In this case, it was only an invigorating blend of black tea with Guaraná and kola nut. This product was handcrafted and is not for sale. Hälssen & Lyon was involved in another project submitted to international competitions in 2015. The creative agency Kolle Rebbe developed a special drinkable version for the internationally renowned porcelain manufacturer Rosenthal. The fine porcelain was packaged in folded tea paper co-developed by Hälssen & Lyon. 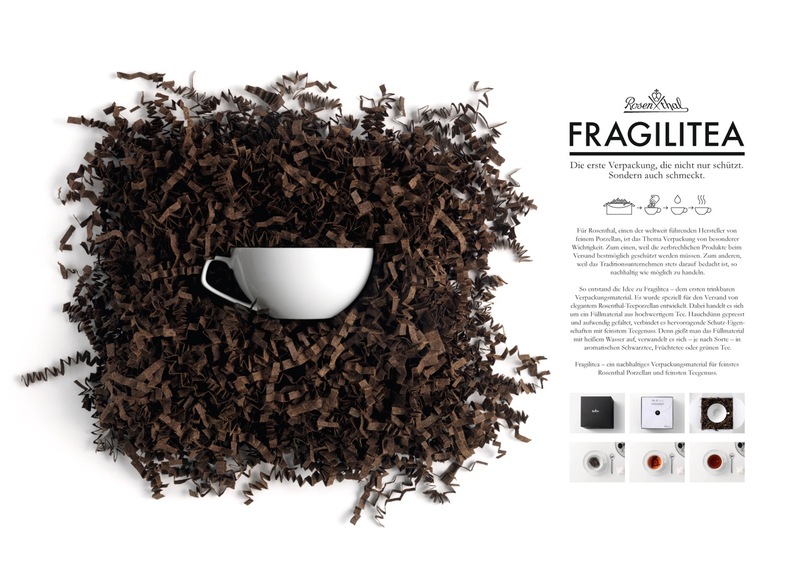 A packaging material, which could also be enjoyed as a delicious brew. The idea attracted great interest among expert jury members in design competitions.